I’m a huge fan of cupcakes not just for kid’s parties where they are a brilliant choice that allows guests to be served quickly and easily, but also for more swish affairs. At my own 40th birthday I had a cupcake tree laden with gorgeous fluffy white cupcakes generously swathed in pink buttercream frosting. Likewise, cupcakes have become a popular feature at stylish weddings. Recently the ProChef Smart Brief (an online aggregate newsletter for the foodservice industry conducted a poll where they asked chefs, “Would you consider adding cupcakes to a gourmet menu?” I was on the ‘yes’ side of the argument, as were over 70 per cent of respondents. To the other 20+ per cent all I have to say is check out an Eini Cupcake– and yes, gentle readers, they taste as good as they look! — and think about revising your (wrong) answer. Would you serve cupcakes at a formal party? Why or why not? Very nice cup cake. Looks like delicious. They are delicious! Eini uses bubble tea flavors in the buttercream and her cake batter is tender and moist when baked. Thank you Dana for all your support. I just read through the comments and noticed something quite funny. 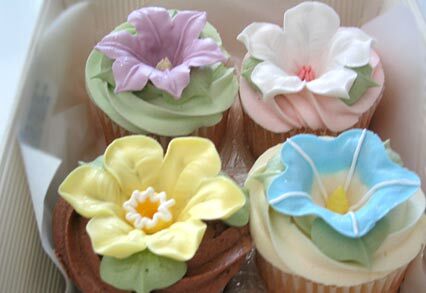 I actually trained with Elisa Strauss from Confetti Cakes (www.confetticakes.com) in NYC. She's absolutely an amazing person and deserves all the credit for everything I've learned. I can just imagine the Cake Dive reading this and wondering... who is Eini again? ?